Sometimes the Christmas holidays call for special jewelry, dazzling with crystals or rich with the red and green colors. We offer here some ideas by many of designers, pieces that are meant to be worn year-round, but they capture the holiday essence! If you want to see more by any designer, click on the item title to get more details, then click on the link provided to reach the artist page! The colors are Christmas holiday red, green and black. You might also browse our Red Jewelry and Handbags pages for items to wear over the holidays, in addition to what we show on this page! 5/8 inch square of metallic-backed fused glass, transparent and dichroic, sparkles in bright tomato red-orange and dark red. Surgical steel post at center. A bit of men's tie fabric in a classic pattern of green and yellow shapes on red background. The fabric is mounted to a flat red color disk, dangling below brass leverback eurowires, with green and yellow bead accent. 2-1/8 inches long overall, 1 inch across, ultra lightweight. Round bangle bracelet is lightweight and wonderful for stacking with other bangles, made in papier mache process from paper pulp, expect minor irregularities of a non-machine product! Decorated and handpainted, then finished with a glossy clear lacquer, a leafy pattern covers a solid background. 7/16 inch wide, about 1/4 inch rounded height. Sizes are approximate for medium wrist, +/- 2-5/8 inches inner diameter. 2 inches long including sterling earwire, 3/4 inch across. Sterling silver circles nested and dangled, hold gold vermeil bezel cups with yummy faceted PERIDOT and RHODOLITE GARNET stones, plus a solid vermeil bubble accent in frosted finish. 18 inches long, goldtone magnetic clasp for easy on and off, made on goldplated wire that you can bend to fit your neckline perfectly! Tiny bronze iris beads make the back of necklace comfortable. 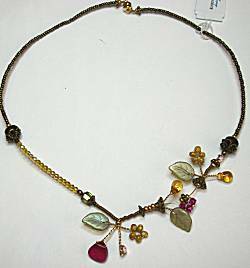 Spanning the front 7 inches are antiqued bronze metal beads that add the vintage look, twisted wire extends out to capture topaz yellow glass beads, shimmering frosty glass leaves, and the fuchsia crystals that mimic berries on the vine. Wire tendrils extend delicately outward up to 1 inch. Earrings are 1 inches long, 7/16 inch across, surgical post at top. Goldplated frames are joined in simple interlocking rings line. Dark ruby red Swarovski crystals show off simply in the prong settings. Gold-plated prong-set frames let the red crystals shine, and the metal backing on the crystals give a silvery sparkle from all angles. Each gem setting is 5/8 x 1/2 inch, joined by jump rings and toggle clasp to 7-1/4 inch bracelet length. About Returns: The Policies & Service Page details our Return Policy. Orders placed between Thanksgiving and Christmas automatically qualify for an extension of the return period FOR MERCHANDISE EXCHANGE CREDIT ONLY through December 31st. Instructions will be provided with your order.